It must be tough to be a mystery writer today. How can you top the gruesome killers that already populate the genre? Between "Buffalo Bill" from Thomas Harris skinning women, John Sandford's eye-mutilating Dr. Mike Bekker, and Patricia Cornwell's werewolf killer, hasn't it all pretty much been done in the gore department? Apparently not. 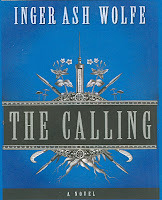 The novel The Calling, by Inger Ash Wolfe (intended to be the first in a series featuring 61-year-old Detective Inspector Hazel Micallef) strains mightily to reach new levels of outrage to inflict upon helpless victims. To add insult to injury, the victims in this story are nearly all terminally ill elderly people. The story opens in the sleepy Canadian town of Port Dundas with a horrific murder. Hazel Micallef, who lives with her 87-year-old mother, eventually realizes that a serial killer is at work. This killer targets the terminally ill who are seeking assistance in escaping lives of pain. Each of the victims is humanely put to sleep, having been given a "tea" of herbs carefully prepared by the killer. Once the victim is unconscious and insensible to pain, the killer dispatches them in horribly imaginative ways. There are guns, knives, hammers and other implements used to end lives, and then the bodies are terribly mutilated: heads are removed and left in freezers, spikes are driven through ears, eyeballs are pushed back into the brain, etc. It's as if the author felt that jaded readers would need ever-increasing horrors to sate their bloodthirsty palates. There is speculation among the police that the killer varied his methods so no one wouldn realize there was a serial killer at work. However, the killer is presented as being totally insane (naturally) so we are never sure if there is a method behind the madness or not. Personally, I think the author just wanted to see how far he/she could go in the butchery stakes. Which brings up an interesting point about this particular work. I had no idea until I was reading some Amazon.com reviews, but the author of this book is a well-known author who is trying out his/her hand in the mystery field. Inger Ash Wolfe is acknowledged as a pseudonym, and there has been rampant speculation in the media about who the "real" author could be. In an interview in January Magazine, the author states, "I wanted these novels to be read in their own context and to succeed or fail on their own terms. I can’t do that under my own name." Hmmm, I wonder if the author is internationally well-known, or would be best known to Canadian readers? Since the story is set in Canada, most of the speculation seems to be that the author is Canadian. Since I listened to the audio version of the book, I noted that the author used the word logy several times. I'd never heard it before, although the context seemed to suggest it meant "sleepy." My handy dictionary defines it as "characterized by lethargy; sluggish." Overall, the story was quite engaging while the female police chief was chasing the killer and watching the bodies pile up. The book just seems to end rather abruptly, though. Hazel, while in trouble with her boss toward the end of the novel, will no doubt be back soon chasing another deranged killer from the Great White North. Oh, and there is an Anglophile connection: the audio book is published by BBC Audiobooks! "Logy" is a Canadianism. I'm pretty sure it is, anyway. At least, I don't think I've ever heard a non-Canadian use it. Thanks for clearing that up! Hmm, maybe it adds to the evidence that the author is Canadian.